The curtains fell on the 2019 edition of the Farfan & Mendes Men’s Outdoor Hockey League yesterday afternoon with the final three matches. Although there was still one round of matches to be completed, Bounty Georgetown Cricket Club (GCC) were expected to clinch the title after defeating their rivals Pepsi Hikers on Saturday at their home ground to go ahead of the points standing by one point. Bounty GCC! Farfan and Mendes Outdoor Hockey League Champions 2019. A win would’ve guaranteed them victory yesterday and it was in doubt since they had to cross sticks with the rebuilding and bottom of the league, Old Fort Hockey Club (OFHC) that were winless. GCC defeated OFHC 7-0 in yesterday’s penultimate game to deflate Hikers that were hoping for a draw or defeat. 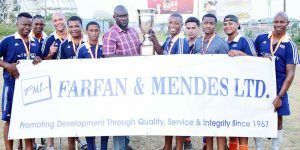 Meshach Sargeant netted a brace while Steven Xavier, Kevin Spencer, Mark Sargeant, Alan Fernandes and MVP of the tournament; Kareem McKenzie, each banged in one goal. In feature game of the day, Hikers defeated Saints Hockey Club (SHC) 5-1, a result that couldn’t take them out of second place as they finished on 19 points, while GCC tallied 20 points. Hikers’ forward Aroydy Branford won the highest goal scorer accolade for his tally of 21 goals.